How will your children contribute to the world? In the last few years, I developed another company: Connecticut Career Counseling. Much like shifting the motivation of students, the work stemmed from what I can only describe as a “calling”. It is mission based and stems from how I want to contribute to the world. We are very fortunate to be living in a wonderful state like Connecticut. With hope, part of what we can do to show our gratitude for our good fortune is create contributors to the world. Are you the parent of a teenage boy? If so, read Daryl Capuano's new book. 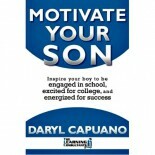 You can change your son's life. These locations are not exclusive as we do service other areas. Contact us for the best possible tutoring and test mastery available for your student-child. © 2010-2016 The Learning Consultants. All Rights Reserved.